In recent weeks, the Transportation Security Administration (TSA) has been the subject of many a debate, tirade, and parody. Also drawing negative attention is the TSA blog and the agency’s other social media efforts. One of the targets of the most ire is a TSA blog contributor known only as Blogger Bob, a Management Analyst with the Office of Strategic Communications and Public Affairs who has been with TSA since 2002. The criticism is not just aimed at the blogging practices, but also management of the blog, including negative attention to its (ironic) lack of transparency. 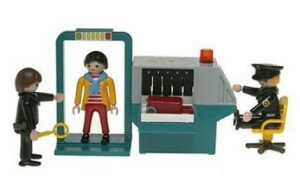 Criticism of the TSA blogger, much like criticism of the TSA itself, is coming from both sides of the political spectrum, from bloggers on the right, the left, and everywhere in between. 1.) Is the new pat-down invasive? No, it’s only for people who set off a metal detector or refuse AIT. 2.) Are you going to punch me in the face? No, blueberry pancakes. By Blogger Bob’s accounts, he is often moderating the blog on his own. That’s part of his explanation for a recent backlog of unpublished comments, despite accusations that the site was censoring those in disagreement with the recent TSA policies. The blog has indeed published countless critical comments, but it has a problem with appearances. 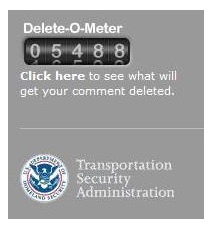 The site’s “Delete-O-Meter” graphic, which appears in the blog’s sidebar, currently lists the number of deleted comments as over 6,400. TSA blogger named Glen explains in a February 2008 post some of the reasons that comments may be deleted, such as profanity, personal attacks, long URLs, or “sensitive information.” The problem is not so much that TSA is deleting comments, but that the rather inappropriately named Delete-O-Meter seems to be almost boastful. [W]e created [the Delete-O-Meter] to show that we’re not really deleting that many comments. Currently, the number is at 5,488. That might seem like a high number, but let’s do the math. Since January of 2008, we have received a total of 41,389 comments. So we’ve deleted a little over 10% and that number includes spam, double or multiple postings, and violations of our comment policy. The Delete-O-Meter is updated manually and is not a live counter. TechCrunch’s Alexia Tsotsis called the role of managing TSA’s online presence the “worst social media job ever.” Blogger Bob responded, “It’s not that bad actually… It’s a challenge. I dig it.” For the record, @TSABlogTeam is only official Twitter account. Fake — albeit often amusing — Twitter accounts include @tsagov, @tsabloggerbob, @tsaagent, @TSAsupervisor, @tsablog, and numerous others. Image by billypalooza (Bill Alldredge), used under its Creative Commons license.